Sea of Thieves only has a few things for players to do, and that lack of variety has been the Xbox One and PC game’s biggest weakness. A new event, The Hungering Deep, tries to break up the grinding with a quest that brings players together to hunt a massive shark. The quest itself is a little basic, but the final battle is a climactic showcase of everything Sea of Thieves does well—and it’s actually bringing players together to cooperate, instead of just trying to murder each other. It’s already possible to encounter the Kraken while sailing in Sea of Thieves. The giant, tentacle beast grasps at unlucky ships who wander into its path. This new event adds The Hungering One, a giant megalodon that players can summon for a massive battle. It’s one of the most exciting experiences you can have in the game. But if you want to survive the challenging boss encounter, you’ll need to cooperate with other players, not just your shipmates. One of the most treacherous aspects of Sea of Thieves is how often encounters between two ships turn into pitched battles, instead of mutual alliances. The lack of cooperative interaction in Sea of Thieves isn’t necessarily a problem—you’re pirates, after all—but it does limit what you can do. 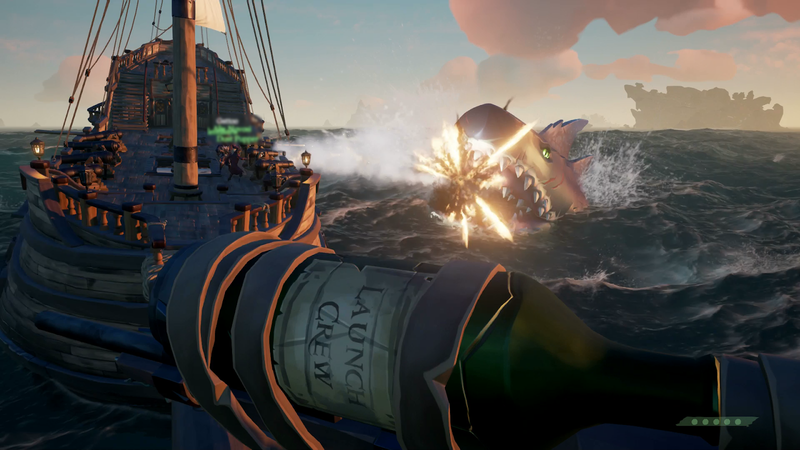 The Hungering Deep encourages player cooperation by requiring at least five players to summon its dangerous megalodon monster. That means that even if you have a full crew of four friends, you’ll need to recruit strangers on your quest. The first time I played, I tried it as a solo player and was picked up by a crew of friendly Twitch streamers who let me tag along. The second time, I captained a full galleon that teamed up with another crew. This kind of friendly interaction is a rarity that I’d never quite seen before, and was a refreshing change of pace. You’ll visit neat locations on your treasure hunt, but there’s nothing really happening there. Unfortunately, some of The Hungering Deep’s luster is worn off by the tiresome lead-up to the big battle. Players need to visit a lone hermit on an island before deciphering clues to locate his journals hidden around the world. It’s supposed to feel like a grand treasure hunt, but it feels a little too close to all the other stuff you do in Sea of Thieves, going from one location to the next without much ever really happening. There’s no special traps to avoid or monsters to brave. The quest feels a bit more like a chore than a search for pirate secrets. Thankfully, the boss fight at the end is a damn good time. Once you complete the scavenger hunt, you earn a drum. When five players bang their drums in the right spot, the Hungering One appears, lurking beneath the waves before popping up to bite chunks out of your boat. Coordination is crucial, with gunners firing cannons to drive the beast back while other crewmates focus on repairs. It’s very easy to lose this fight if you’re not paying attention and managing your ship properly. Each attack rocks your boat, possibly launching your friends into the sea. It’s a rough and raucous showdown full of explosions and teeth that’s much better than grinding out the same skeleton hunt bounties over and over again. The rewards for slaying the beast are surprisingly modest: a few personal cosmetic options and a new ornament to place on the bow of your boat. If you’re expecting epic loot, The Hungering Deep won’t deliver. But it does offer an amazing fight and a blueprint for how future events could bring the community together in new and exciting ways. Last night, after a particularly dire battle with the Hungering One, I saw four ships sail into a cove together, all four crews joining in a bit of celebratory drinking and dancing. Before this event, that would have been unfathomable. If The Hungering Deep is where things will go for Sea of Thieves, the future looks good.